Want to create a miniature garden with living plants? This guide by expert Janit Calvo has all the information and resources you need to get started. Find out about the best plant choices, where to get them, and how to plan your garden and accessories for a creative and enchanting living work of art. 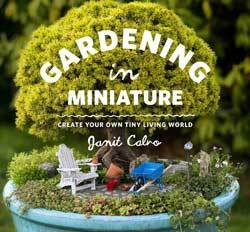 Janit is the best-selling author of Gardening in Miniature: Create Your Own Tiny Living World and Gardening in Miniature Prop Shop. For more tips, you can also find 7 Mistakes to Avoid When Growing Miniature Plants here. Miniature Garden vs Fairy Garden – What’s the Difference? A miniature garden is literally a living garden in miniature. The focus is on creating and growing the garden on a small scale. Miniature and dwarf trees and shrubs are paired with small-leafed perennials and groundcovers that make up the understory of the garden bed. At least one “man-made” miniature garden accessory is needed to tell the scale to the viewer, like a birdbath or bench. Fairy gardens are not as rigid in design and scale and the focus is usually on the accessories and the fairies, and the plants are decided upon afterwards if at all. For fairy garden resources, see Easy DIY Fairy Garden Decor. It’s very helpful to know the difference when shopping for plants and accessories. Attention to scale (proportions) is essential for a miniature garden to look just right. In addition to these tips, Janit tells us 7 Miniature Plant Growing Tips You Can Avoid. 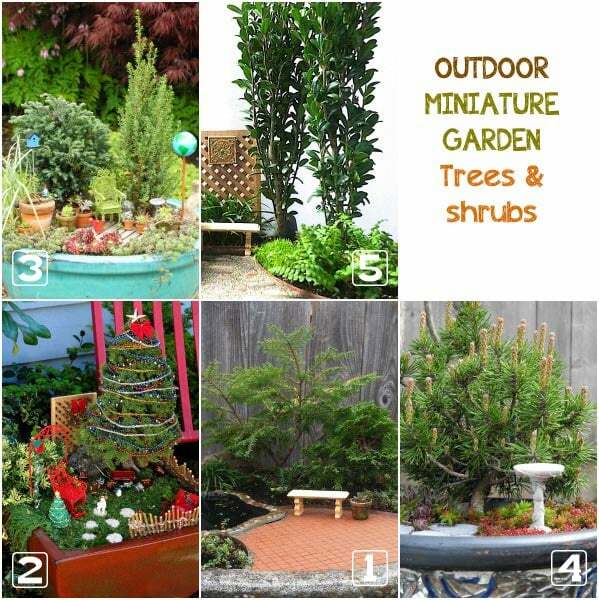 Make it a real garden: Use small trees to add height to your miniature garden to mimic an outdoor garden. Use the shorter plants as bedding plants to create a lush understory by mixing up the textures of the plants. All the plants in your container should have the same light and water needs for the best success. Light: Grow bulbs are the same as full-spectrum or 5000K bulbs and are less expensive. They come in a variety shapes to fit most lamps, including regular desk lamps. Air Temperature: Indoor plants are tropical plants that need the temperatures to stay above 60F / 15C all year round. Soil: Use organic potting soil with no added fertilizers or water-retaining polymers. Water: Your pot should have a drainage hole unless you understand perfectly how to water without one. Get one with drainage hole and matching saucer, it’s just easier. Use a good quality plant coaster underneath the saucer to protect your furniture. Pay attention to the scale of your miniature garden. It may seem daunting but as with anything worthwhile, it becomes pretty easy once you get your head around it. It is important to remember when you are starting that the size of the accessories dictates the scale, not the plants. Keep all the accessories the same scale so you don’t confuse the viewer. Just like a well-done dollhouse, it is the realism that will make the scene enchanting and magical. 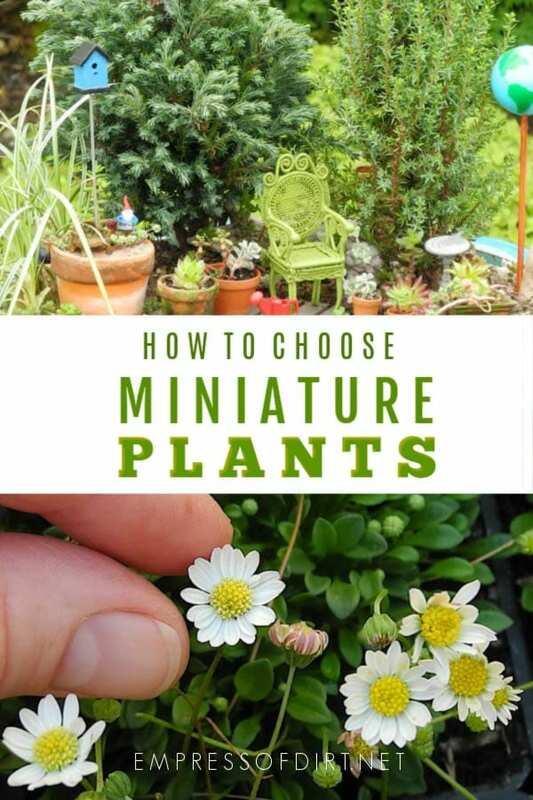 Here’s a video that will help you to understand how the size of the accessory can drastically change the perceived size of the miniature garden. Here’s another helpful way to be certain your container, plants, and accessories work well together. For containers 10″ in diameter and larger, or for in-ground mini gardens, use the large sized accessories or 1″ scale. For smaller pots 10″ in diameter and under, use medium size or ½” scale. 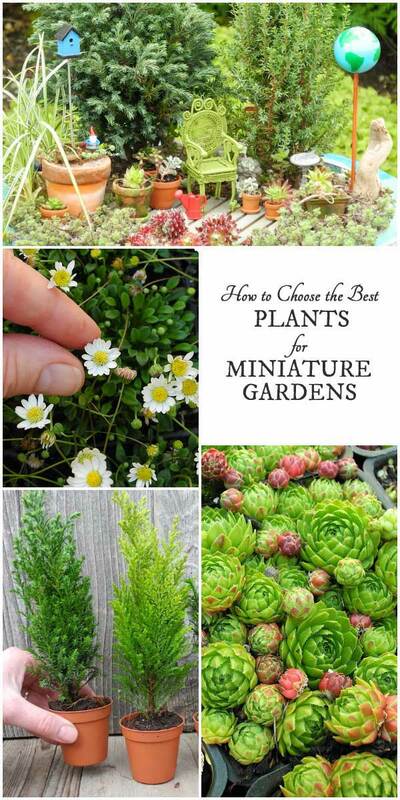 For tiny pots 2″ to 4″, use the small size or ¼” scale, HO or N scale. 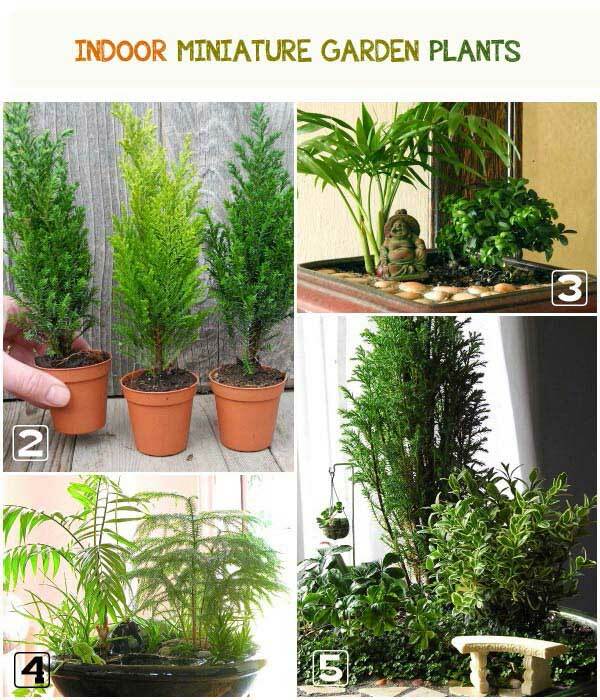 When looking for trees that you can use indoors for your mini garden, look for plants that resemble full-sized trees. Note that you can trim off the bottom leaves of a plant to expose the trunk to make a shrub into a tree. 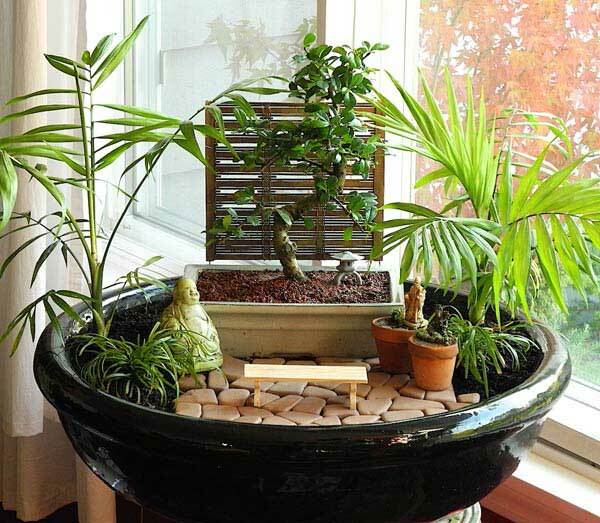 You can use indoor bonsai trees in your miniature garden but use them as potted plants so you can maintain them easily. Match the bedding plant’s growing requirement with the tree that you use. For example, a favorite combination is an English Boxwood, Dwarf Mondo Grass and Baby Tears for a garden that will do well in bright, indirect light with regular watering. ** Can be grown outdoors too, but crosscheck for your heat and cold zones first. Other types of trees are baby trees that have small leaves and grow slowly, like the Boxwood or Japanese Holly. The ideal plants for the miniature garden bed are small-leaved and slow growing. 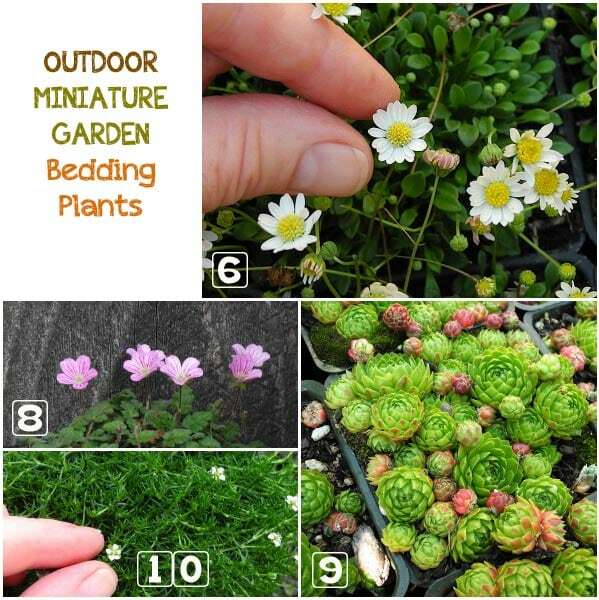 Ground covers, sedums, rockery and alpine plants are general plant families that can be explored for more options for the mini gardening bed. Resist the urge to plant herbs, they will out-grow the miniature garden within one growing season. How to start miniature gardening can often be overwhelming with all the choices and possibilities but the best place to begin is to decide where the miniature garden will live. Will it be planted in-ground or in a container? Where will that container be placed? Then you can interpret the light requirements (full sun? shade?) and what soil is needed (potting soil for pots, organic garden soil for the garden bed) for that spot. For mini gardens in pots, choose a nice container that you enjoy and perhaps will match your décor because some miniature garden plants can happily grow in a pot for over 10 years. Once the placement is decided, you can research the plants that suit that spot to greatly narrow-down your search. Choose taller plants for the back of the pot, shorter plants in front and at least one tree to make it a “real” garden. Our Indoor/Outdoor Miniature Boxwood Kit will jump-start your learning curve and get you miniature gardening in one afternoon. 2 Where can I buy these plants? Two Green Thumbs has been supplying America with miniature garden plants since 2004 and have developed the best methods in the country to ship live plants safely and securely anywhere in the lower 48 or Alaska. Check with your local independent garden center using the plants listed here as an example. Caution: some garden centers may not know what a “good miniature garden plant” or a “fairy garden plant” is yet. Other garden shops may sell you young plants that grow up too fast, or plants that simply don’t look right in the miniature garden. Be sure to use the lists here as a guideline. Note that during the winter holiday months you can find young trees and plants for sale at your grocery store’s floral department or in some independent food stores, like Trader Joe’s. 3 Where can I find realistic accessories? For realistic miniature garden accessories, please visit our store where we have been resourcing miniatures for years that can hold up to the weather and rain, and can be easily renewed and refreshed. See them sorted by scale here. Find possibilities locally from dollhouse miniature stores but be careful to choose items that can withstand the weather and moisture. Other places to look are flea markets and thrift stores. 4 Can you tell me how to assemble a miniature garden once I have all my supplies? 5 Do you have any fairy garden resources? The biggest garden niche in years combines the joy of gardening with the magic of miniatures. Gardening in Miniature is a complete guide to creating lush, living, small-scale gardens. 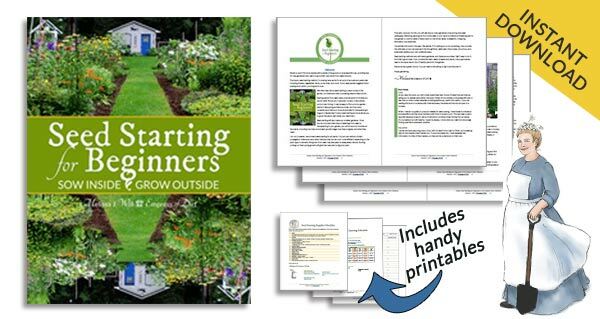 It has everything you need to pick up this new hobby, including scaled down garden designs, techniques for creating tiny hardscapes, miniature garden care and maintenance, tips on choosing containers, how to buy the right plants, and where to find life-like accessories. Inspiring step-by-step projects feature basic skills that can be recreated in any number of designs, like a tiny patio, a trellis, a pond, and a secret garden. Whether you want to build a miniature empire in your garden bed or design a private garden with a pebble patio for an indoor centerpiece, Gardening in Miniature is the primer for creating your own tiny, living world. Two Green Thumbs Miniature Garden Center was created out of a need to find the right plants, parts and pieces that work the best for the new miniature garden hobby. Started in 2001, the business has grown-up slowly to become the source for everything miniature garden. The online-only business is run by a husband and wife team and based in Seattle. Janit Calvo is an artist, miniaturist, gardener, and entrepreneur. Janit resides with her husband in a full-size house and garden in Seattle. Inspired by her first miniature garden’s long life and easy maintenance, Janit started Two Green Thumbs Miniature Garden Center in 2001. She has won many garden and miniature show awards, and her gardens have appeared in magazines in Canada, Japan, Romania, The Netherlands and many US publications such as the Seattle Times, Birds and Bloom and Woman’s World. Her bestselling bible for the hobby, Gardening in Miniature: Create Your Own Tiny Living World has now been translated into German, Turkish and Korean. I’m going to need a lot of help, but with so many great ideas, I’m sure I will have a great time. Two Green Thumbs Miniature Garden Center. Can’t wait to make one for a Mother’s Day present! I live in Calgary, AB and the name of the garden center is ‘Two Green Thumbs Miniature Garden Center’. The book looks great! Love miniature gardens! I live in 100 Mile House, British Columbia, Canada. The name of Janit’s garden center is Two Green Thumbs Miniature Garden Center. The giveaway ended already but keep subscribed for more coming up! I live in Islesboro , Maine USA and Janits garden center is Two Green Thumbs Miniature Garden Center . I live in Buffalo, New York and Janit’s garden center is named Two Green Thumbs Miniature Garden Center. I live in Priest River, ID, USA and Janit’s store is Two Green Thumbs Miniature Garden Center . Hi! 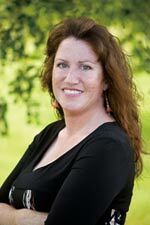 My name is Gina and I live in Gautier, MS. Janit’s garden center is Two Green Thumbs Miniature Garden Center. Just love seeing these and making some with my grandkids! Got my fingers crossed!!! I live in Grand Forks ,ND USA. Because of the cold winters i enjoy doing miniature gardens indoors. Would love Janet Calvos book with her wealth of information. Janet Calvo is one of my favorite gardeners, and her Two Green Thumbs Miniature Plant Nursery is an incredible resource. Thanks for featuring her on my MOST favorite gardening website!!! I live in Willits, California and made my first miniature garden this summer. Thanks for all your hard work!!! I have made a miniature succulent and cactus garden for inside my home, and would be interested in creating more. I love to look at work done by others, also. I live in Kennett Square, PA and her garden center is twogreenthumbs.com!!! I really enjoy your newsletter! The name of garden centre is Two Green Thumbs. I would love to win your book. I also receive Janet’s Mini Garden Gazette, it always has wonderful tips in it..
Janit’s garden center is called Two Green Thumbs. I live in Michigan. I’ve been interested in trying a miniature garden to get me through the long winters here. I miss gardening so much! This book may give me the ‘jumping off’ point to get my ideas together and finally make this garden happen!